With the Champions League and Europa League about to start up again, I thought that it would be a good idea to take a look at each of the main European leagues. 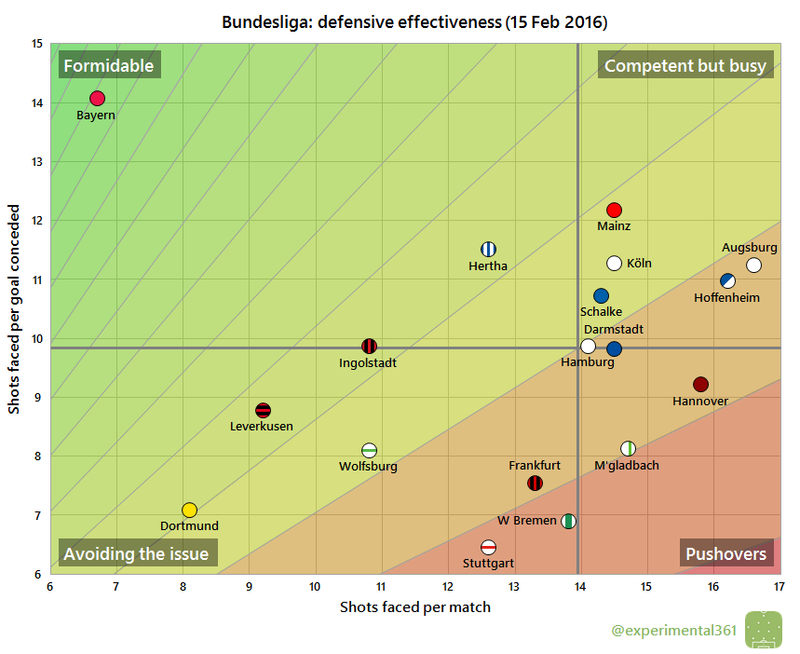 Here are updated scatter graphics for the Bundesliga, which compare the attacking and defensive performance of each club. These are explained here if you haven’t seen them before and you can see the previous set here. Bayern remain unsurprisingly and graphic-stretchingly dominant in the bottom right corner, taking over 20 shots per match and allowing about a third as many in return. 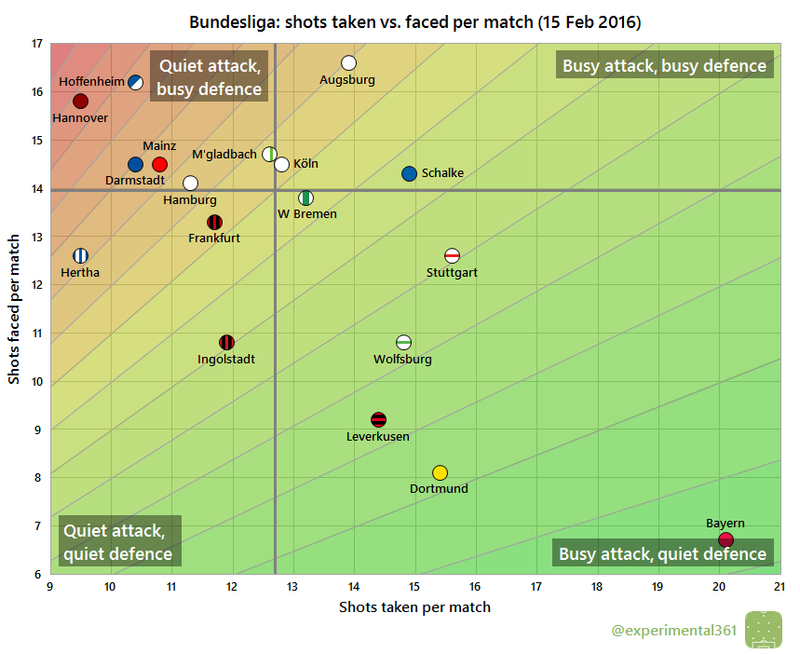 Dortmund and Leverkusen are the next most dominant, with Wolfsburg, Stuttgart and Schalke taking a similar amount of shots but without being as restrictive at the back. In the top left we can see that Hoffenheim and Hanover tend to let their opposition do most of the attacking, so it’s not surprising that both occupy relegation spots at the moment. Again we have Bayern in the far bottom right, but three sides – Dortmund, Borussia and Hertha – are all more clinical finishers. 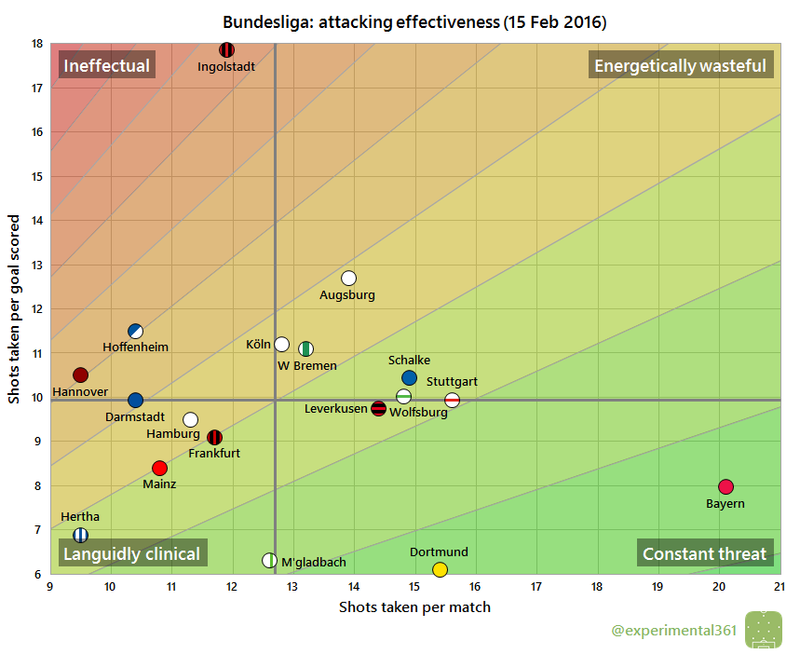 However none of these take anywhere near as many shots, with Hertha taking fewer than half as many per match. At the top we find poor Ingolstadt, who need around eight more attempts to score each goal than the average team, and nearly three times as many as Dortmund. The division’s second most wasteful finishers are Augsburg, who sit close to the relegation zone despite taking almost as many shots as third-placed Leverkusen. Bayern complete a hat trick of being lodged in the “awesome corner”, allowing around half as many shots as the average team and soaking up around four more for each goal conceded. While Dortmund permit a similarly low number of shots against them, only Werder Bremen and Stuttgart have absorbed fewer for each goal conceded. Their attack may be having an awful season, but Ingolstadt‘s defence is impressive: only the current top three have allowed fewer shots at their goal.